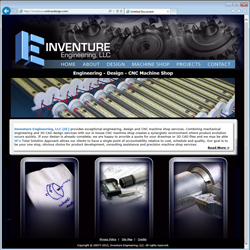 Project Scope: Inventure Engineering & Machine, LLC provides exceptional engineering, design and CNC machine shop services. Combining mechanical engineering and 3D CAD design services with our in-house CNC machine shop creates a synergistic environment where product evolution occurs quickly. If your design is already complete, they are happy to provide a quote for your drawings or 3D CAD files and we may be able to offer cost savings suggestions along the way. If your starting with the proverbial ‘napkin sketch’, IEM can help turn your idea into reality. IEM is proud to measure customer satisfaction in that over 90% of our business comes from repeat and/or referred clients. Design Components: Originally this was a site re-design. The old site was very lacking in both visual and content impact. A new identity was created for them including colorizing their existing logo. This new logo was then translated to a new design for their web site. Responsive - Mobile Friendly: In December of 2017 we converted the site to be fully mobile friendly> for PC, tablets and cell phones and added in a new product. 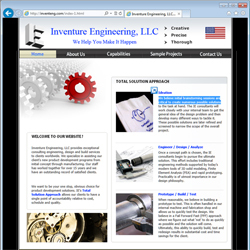 “ When considering redesigning our web site we interviewed four website development firms and found Vortices Design to be the best all around solution regarding: technical depth, creativity, schedule and cost. The owner, David Maria, is great to work with and patiently answered all of our questions along the way. Developing a website is very subjective and for many of us, we don't know what we like (or don't like), until we see it. Vortices Design did an outstanding job of tweaking and changing things until we were happy. The resulting website is much more than we expected, and our search results improved immediately! 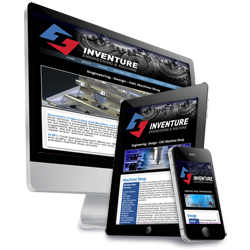 I highly recommend David and the Vortices Design team for any website project.